Insider Monkey finished processing more than 700 13F filings made by hedge funds and prominent investors. These filings show these funds’ portfolio positions as of September 30th. In this article we are going to take a look at smart money sentiment towards Palo Alto Networks Inc (NYSE:PANW). Palo Alto Networks Inc (NYSE:PANW) was in 46 hedge funds’ portfolios at the end of September. PANW shareholders have witnessed an increase in support from the world’s most elite money managers recently. There were 42 hedge funds in our database with PANW holdings at the end of the previous quarter. However, it didn’t make it as one of the 30 stocks billionaires are crazy about: Insider Monkey billionaires stock index. The Santa Clara, Calif.-based multinational cybersecurity company operates a core platform based on advanced firewalls and cloud-based offerings that extend those firewalls to cover other security areas. The company’s stock lost a bit of sheen in October after it reaffirmed its fiscal first-quarter 2019 guidance. Palo Alto expects quarterly revenue in the range of $625 million to $635 million, or a 26% year-over-year increase at the midpoint, with adjusted earnings per share of $1.04 to $1.06. Consensus estimates reveal the market wanted higher returns, with many analysts projecting earnings and revenue at the high end of Palo Alto Networks’ respective guidance ranges. Light Street Capital’s Glen Kacher was bullish on the stock at the Sohn Conference due to the company’s opportunity in the cloud security space, forecasting 90% upside potential over a two-year horizon. Kacher discussed the immense need for online security in an era of government-funded criminal hacker organizations looking to divert wealth to their digital coffers. The threat is grave enough that a single large-scale cyber theft could potentially trigger a financial collapse through widespread fear of the banking system, potentially wiping out over $20 trillion in wealth. Given that, Kacher questioned the U.S government’s spending on cyber security, stating that they spend just $13 billion annually to fight a cyber war that’s actually occurring right now, while spending $600 billion on defense for a conventional war that isn’t occurring (and isn’t very likely to). That security is made all the more challenging by the increasing prevalence of the hybrid cloud model in IT, where data must travel over many clients and networks, which creates a huge opportunity for Palo Alto Networks Inc (NYSE:PANW)’s leading hybrid security solution, which is capable of protecting both the enterprise and cloud operations of companies with a single solution. And there’s far more growth in cloud yet to come, as Kacher told CNBC following the event that only 14% to 15% of computing has been shifted to the cloud thus far. Palo Alto is hugely successful at capitalizing on its customers through its transition to a subscription-based model, pulling in four-times as much revenue per customer as its competitors, and Kacher predicts that will lead to robust revenue growth of over 20% for years to come, outpacing overall firewall market growth by 3X. Kacher also likes that the company’s management has become more disciplined when it comes to expenses, which he estimates will help drive operating and free cash flow margins to 27% and 41% respectively by 2021. In June, CEO of Palo Alto Networks, Nikesh Arora, purchased 294,247 shares in the company at $214.81 apiece. The company’s stock closed at $166.59 on Nov. 27. Today there are dozens of gauges stock traders have at their disposal to appraise stocks. A couple of the most useful gauges are hedge fund and insider trading indicators. We have shown that, historically, those who follow the best picks of the top hedge fund managers can outclass their index-focused peers by a healthy margin (see the details here). Let’s check out the new hedge fund action encompassing Palo Alto Networks Inc (NYSE:PANW). At the end of the third quarter, a total of 46 of the hedge funds tracked by Insider Monkey were bullish on this stock, a change of 10% from the second quarter of 2018. 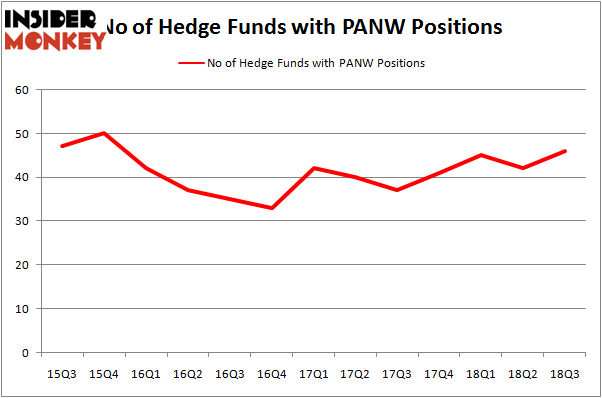 The graph below displays the number of hedge funds with bullish position in PANW over the last 13 quarters. With hedge funds’ sentiment swirling, there exists a few key hedge fund managers who were adding to their holdings substantially (or already accumulated large positions). More specifically, Renaissance Technologies was the largest shareholder of Palo Alto Networks Inc (NYSE:PANW), with a stake worth $1047.7 million reported as of the end of September. Trailing Renaissance Technologies was Two Sigma Advisors, which amassed a stake valued at $310.8 million. Arrowstreet Capital, Cadian Capital, and Millennium Management were also very fond of the stock, giving the stock large weights in their portfolios. Now, specific money managers were breaking ground themselves. Melvin Capital Management, managed by Gabriel Plotkin, established the most outsized position in Palo Alto Networks Inc (NYSE:PANW). Melvin Capital Management had $56.3 million invested in the company at the end of the quarter. Joe DiMenna’s ZWEIG DIMENNA PARTNERS also made a $13.8 million investment in the stock during the quarter. The other funds with brand new PANW positions are Phill Gross and Robert Atchinson’s Adage Capital Management, Andrew Weiss’s Weiss Asset Management, and Paul Holland and Matthew Miller’s Glaxis Capital Management. 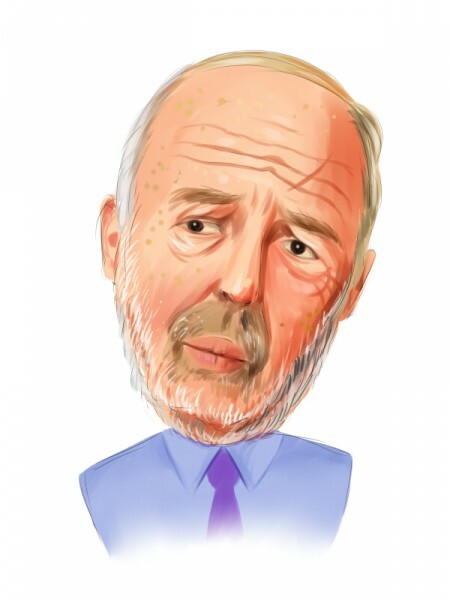 Let’s now review hedge fund activity in other stocks – not necessarily in the same industry as Palo Alto Networks Inc (NYSE:PANW) but similarly valued. These stocks are Motorola Solutions Inc (NYSE:MSI), POSCO (NYSE:PKX), WEC Energy Group, Inc. (NYSE:WEC), and Waste Connections, Inc. (NYSE:WCN). All of these stocks’ market caps match PANW’s market cap. As you can see these stocks had an average of 22.25 hedge funds with bullish positions and the average amount invested in these stocks was $589 million. That figure was $2889 million in PANW’s case. Waste Connections, Inc. (NYSE:WCN) is the most popular stock in this table. On the other hand POSCO (NYSE:PKX) is the least popular one with only 14 bullish hedge fund positions. Compared to these stocks Palo Alto Networks Inc (NYSE:PANW) is more popular among hedge funds. Considering that hedge funds are fond of this stock in relation to its market cap peers, it may be a good idea to analyze it in detail and potentially include it in your portfolio.